There’s nothing worse than a no-show. Not only do you not make money off the careless client, but you also lose money if you can’t fill that block on short notice. Sadly, they’re a fact of life and there’s only so much you can do about it. After all, meetings are going to run long, kids are going to get sick and even the best of us are going to space out now and then. On the other hand, there are the habitual offenders – the banes of your business – that don’t value your time. Those are the folks BookedIN can help you get the better of while saving you some time. BookedIN lets you check out the complete appointment history for any client, so it’s easy to see who’s missed appointments and how often. 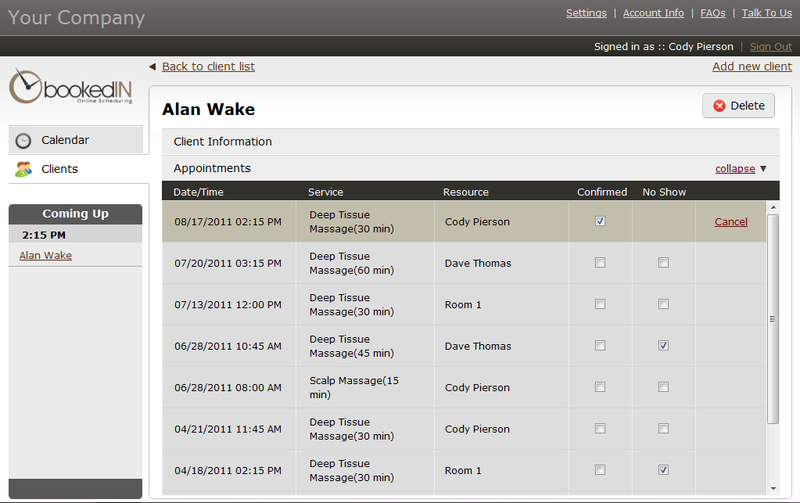 Since you’ll be checking the client file to find their contact info while making reminder calls, just scroll down a little and see what they’re appointment history looks like. If they come in like clockwork and have never missed an appointment you might save yourself a call, but if their record is a little spotty you might make a second call rather than leave a voice mail and hope for the best. It’s a simple step to take and, if you already make reminder calls, it’s just one more step that could mean a lot fewer no-shows. It’s also an exercise which will get you acquainted with just how many no-shows you actually have and how much they’re costing you. Whether you find out everything is kosher or that it’s time to re-think your no-show policy, it’s better to have that info than to go without it. Knowing is half the battle, after all.